For 3.5 stars, my sound effect story takes place in Delia’s lounge. She is singing in the background as the listener hears two people have an exchange. The man comes in first, lights a cigarette and starts to drink. The woman follows shortly afterward, sees the man, sits beside him, and opens a briefcase. He is surprised, she is not. No one else is the wiser. 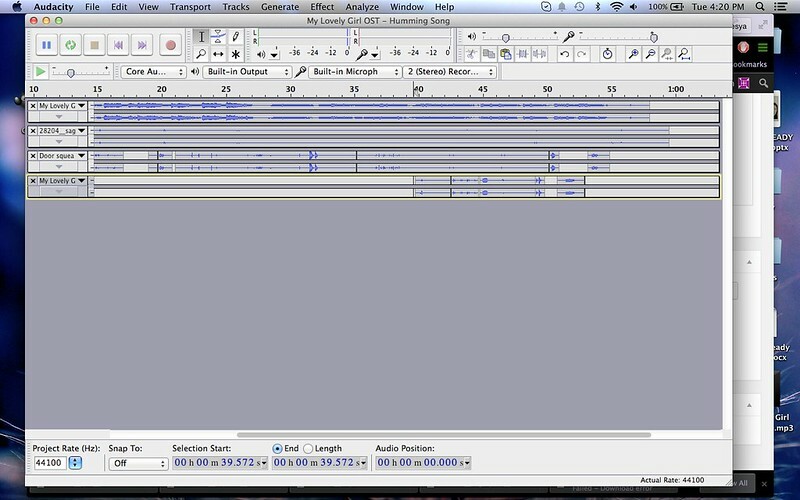 All of these clips, I cut, pitched, changed speed or tempo, or altered in some other way. I didn’t find any good female sound effects, so I just recorded myself making some vocalizations and pitched those down about 15%. That’s how I layered everything, in case you’re interested. Effective use of layers. You are one up on many of us in understanding that it is layers that makes it all pull together and not just a sequence of linear clips. Nice Job! and great explaining what you did to create – very helpful. Thank you! I think that knowing how and where to cut an original clip is even more important, though. The pacing and implications change so much between 2 seconds of one coughing clip and 5 different coughing sounds strung together. Very nice cuts! Everything blended well together, and it was often difficult to hear when or where things were fading in or out. Very effective use of the clips available to you, and your own successful attempts at vocalizations. Outstanding.